When we appreciate art, what are we looking at, appreciative about? The colours, form, textural vocabulary, narrative…? And when we are engaged in that metaphysical communiqué, away from the mundane, transported to a different level, we are lost for words that can express the profound feeling that envelopes us; at the other end, we chose to find solace in wordy articulateness that might sound sophisticated but convey no real essence. This is primarily because of the transience of emotions that attack one when one appreciates a work of art. Ganesha’s is one such form. Not only can it be and has been played with, modified, adapted, interpreted, humanized, etc., to the tee; but its symbolism is legendary to say the least. History relates that Ganesha has been the Indian craftsmen’s muse for several centuries, where the form has graced idols, icons and imagery in ethnical tribal art and craft viz., dokra or metal art and terracotta or mud art. 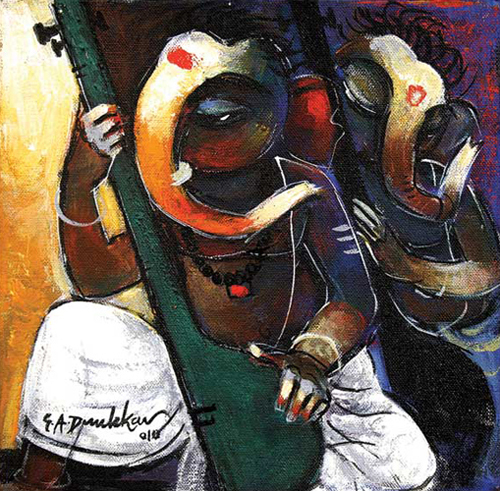 Other materials that have popularized the art form are ivory, sandalwood, wood, glass, porcelain, even crystal. Lladro and Swarovski have immortalized the form with their exquisite creations. 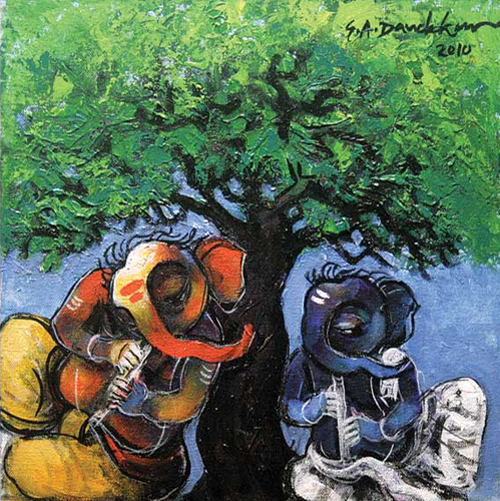 It is a visual phenomenon: whether Ganesha is painted or sculpted, in any avatar – as a playful child, as a musician, as a king, whatever… and in any profile – reclining, playing, standing, dancing etc. 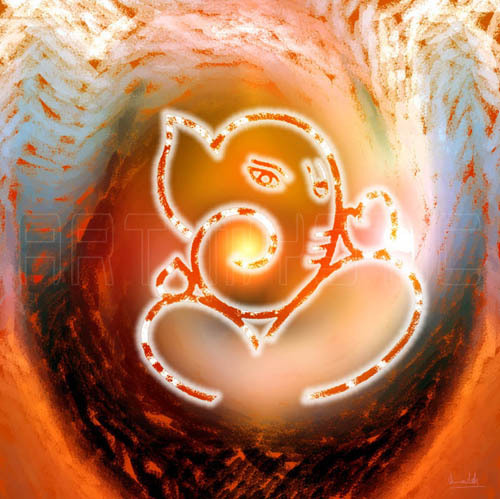 It feels wonderful to see very modern interpretations of Ganesha – minimal line drawing showing a silhouette; non-representational symbolism; realistic contemporary portrayals et al. With the festive Ganesh Chaturthi in the offing, here’s a visual treat of the Elephant-headed God and his myriad manifestations. a few years ago i presented my mother with a little bronze Ganesha. It's always on her desk.